What is a Menopause test? What is this test used for? 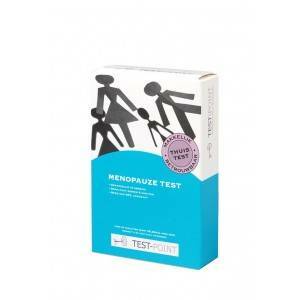 The Menopause test by Test-Point allows you ascertain whether you are going through menopause. It tests urine for the presence of follicle-stimulating hormone (FSH), which is a marker for menopause. You can read the results on the test stick within 10 minutes. A Menopause test allows you to ascertain whether your symptoms are caused by menopause, or if they could possibly have another cause. If you have more or less regular periods, you should perform the test in the first week of your menstrual cycle. If you don't have regular periods, you can test at any time of the month. Remove the protective cap from the test stick, hold the absorbent tip pointing downwards and place directly into the urine stream for at least 10 seconds, until it is thoroughly wet. If you prefer you may urinate into a clean cup and then immerse the absorbent tip into the urine for 10 seconds. Replace the protective cap over the wet absorbent tip and wait 5 minutes before reading the result in the window. The test stick has two windows: the square window is the result window. The oval window is the control window. The line in the control window shows that the test is working properly. A positive test, indicated by a line in each window, means that you are in a stage of menopause. If you have a positive test you should see your doctor for advice on how to relieve your symptoms with medication or natural supplements. The doctor will also be able to advise you on how to deal with the risks of menopause such as increased chance of cardiovascular diseases and osteoporosis. A vague line or no line in the test window indicates that you have not yet reached menopause. It may, however, still be advisable to contact your doctor to see what is causing your symptoms. If no lines appear in either window, or a line appears in the test window but not in the control window, then the test is invalid. Dispose of the used test stick and repeat the test. The Test-Point Menopause test has no side effects. The Test-Point Menopause test is only intended for use in women.